Vision - Icron Technologies Corp.
USB 3.0’s distance is specified at 3 meters. When greater distances are required, consider Icron’s Spectra™ series of extenders which supports USB 3.0 5Gbps throughputs up to 100 meters over OM3 multimode fiber optic cabling. A true plug-and-play solution, the Spectra line of products are compatible with all leading operating systems and features two locking USB ports and a locking power connector. These products areUSB3 Vision compliant and are warranted for 2 years from the date of purchase. Backward compatibility to USB 2.0/1.1 is not supported by this particular extender. Icron’s USB 3.0 Spectra 3022 features ExtremeUSB® technology and extends USB 3.0 Vision Cameras up to 100 meters with full camera performance: resolution, frame rate and color depth. 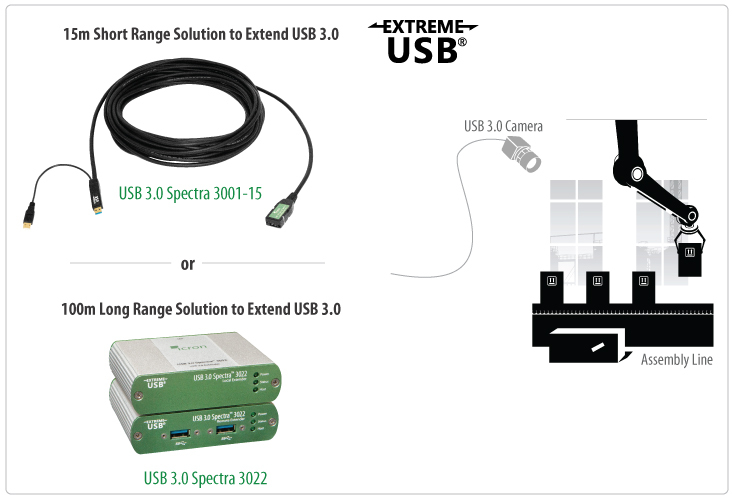 The new Specrta 3001-15 is a short range alternative to extending USB 3.0 Vision Cameras over a 15 meter active copper cable. Below is an example of a typical USB3.0 Camera extension requirement in a factory automation application noting the PC host isn’t shown.